Anyone from edison/Middlesex area ? I am in the stage of gathering parts. Since I am going to use nema 23s, think standard prusa parts will not work. So, i want to start with 1x2 wooden reprap. It would be nice to work with someone who already built a reprap and one that can help with printing some plastic parts when necessary. Edited 1 time(s). Last edit at 10/16/2011 08:25PM by x1050us. Re: Anyone from edison/Middlesex area ? I live in East Windsor and have been working on my Prusa since the summer. I love driving, so not a concern. 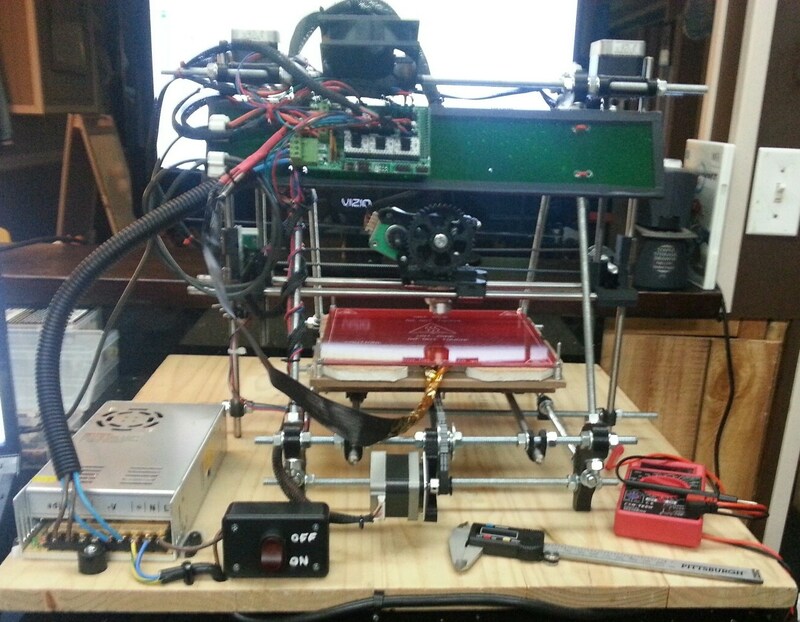 I am planning on retrofitting a home built cnc to reprap as well that will be using the nema23's as well. So it would be nice to have someone else to work with! Hey Folks I live in Edison, If you guys need any help or just want to show and talk about your machines PM me. I have made a prusa and am making a mendel 90. I am in Edison NJ.. Just starting to get into this and looking at building my first machine. Hi, I see this isn't the most recent post but was hoping to find someone in the NJ to talk to or maybe meet up with. I'm at the calibration phase of my first build a Prusia v2 and could really use someone who knows what there doing to help me get things moving right and calibrated. I'm in Scotch Plains and would be willing to travel or have someone here. Can also meet at my shore house in Belmar in the summer if that would be easier. I attached a photo of where I'm at and am waiting on replacements for the X-END Idler and X-End Motor mounts which developed small cracks when I tried to replace the glued PLA bushings with metal ones. This was cauing one side to bind up and skip up/down along the Z. Anyway plan to replace those once they get here then hopefully get things calibrated but my initial attempts I was having some problems. X only moves in one direction away from the endstop, Z motors buzz but because of the cracks and lack of springs between the bolts there is some slipping and they struggle. Hopefully new parts and springs help with that, I tried adjusting the drivers but didn't help so far. I'm sure I have the end stops wired properly but have to rule out some other things as to why the X only moves in one direction and also does't always resond to my manual steps. Y not moving at all right now and extruder churns and moves but it sounds strange and definitly isn't moving right. I'm currently using Arduino Mega 2560, Ramps 1.4, Sprinter, Pronterface. When I tried the Ramps 1.4 test code everything seemed to at least do something even the lights on my heated bed lit up but when I try it myself the heated bed doesn't seem to do anything, can't get it to heat up. Thinking it's probably a combination of things btu mainly I thnk it's something with the firmware settings/configuration. Any help would be great and I'm pretty much into everything and would be great to be able to talk and work on some cool projects with people near me. Well, hopefully someone reads this, is in the area, and still has some time to mess with this stuff. Hi, just joined this group so I am way behind on the posts. My son and I have been messing with 3D Printers since 2009. I built a RepRap Mendel back in 2010 for Maker Faire New York 2010. Many printers later my son just finished a Prusa Mendel i3 and it prints great! Took him 3 nights to build and calibrate. Cudos to Joe Prusa for all his encouragement, help and instructions! We will have it on display and printing in the 3D Printers Villave at Maker Faire New York 2013 in September. If you want to see dozens of printers working in all variations, come on out and visit. If you want to join other printers in the village, please sign up! Bring your questions and cameras, we are all there to demonstrate, explain and help. Hey guys, I'm in Edison and I'm putting together my first reprap. I have all the hardware setup, and I'm now working on the electronics. I was hoping I could tap into some of your experiences. I've plugged in my board which I bought assembled, reprap documents says that the board should come preloaded with the firmware, when I plugged it in I'm not getting anything. I run the reprap software and I'm trying to just test the motors to make sure I have them wired correctly. I'm just having a hard time trying to figure out how to start. any suggestions would be greatly appreciated. I'm near edison area as well. I have not finished my i3 prusa yet, I started years ago, but life, kids,moving, etc took priority. Meanwhile I have all the parts sitting in a box and I got to the point of starting with the electronics but never moved on. Hope someone can help me get things going if I have trouble.